Most tax allowances are provided on a ‘use it or lose it’ basis and annual tax planning is, therefore, a must. 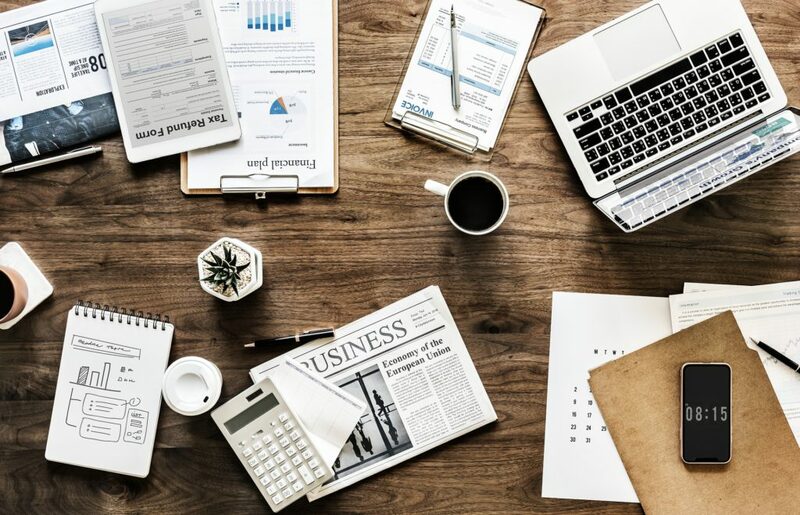 Often overlooked, the consistent and methodical use of available tax allowances can significantly enhance the after-tax position of an investor, in turn aiding the earlier accomplishment of financial planning goals. Until now, I’ve never bothered to quantify a ‘pounds and pence’ value to this planning but curiosity as to its worth got me thinking. Calculating the worth of using all available tax allowances would be a monumental if not impossible task. There are savings allowances, dividend allowances, pension tax-relief and many, many, more, along with too many variables to mention, so in this blog I’ve kept things fairly simple by looking specifically at the use of the annual tax-free Individual Savings Account (ISA) currently £20,000, and the Capital Gains Tax (CGT) annual exempt amount, currently £11,700. These allowances are often used together at this time of the year. ISAs and the CGT exemption are just two tax allowances that investors fail to take advantage of with any consistency. Usually, through a misunderstanding of the rules, forgetfulness or inertia, it just doesn’t get done. Well, I’m here to show you that the additional benefit could be worth as much as £57,000 over a 10-year investment term, which can’t be ignored. This is having spent some time methodically calculating the increased worth of using ISA and CGT tax planning, over and above the after-tax results of an investor who does not. The additional £57,000 ‘in your hand’ increase is not because of investing more, gaining a better return or keeping costs lower, but purely because of making sure available ISA and CGT tax allowances get used each year without fail on the money already invested. 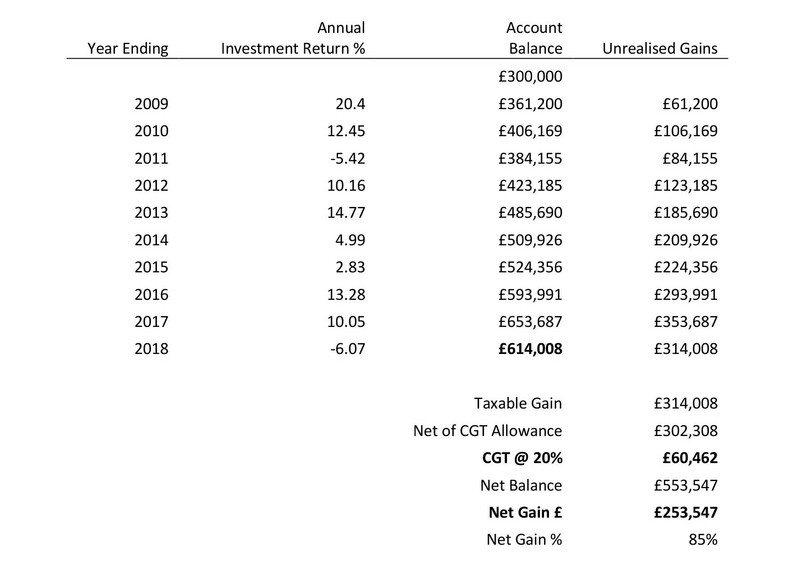 In table 1 below, you can see that a higher rate tax paying investor with £300,000 to invest on the first day of 2009 could have turned their initial investment into £553,547 after CGT, over the most recent 10-year complete year time frame. This scenario assumes that the whole initial investment is placed in taxable funds, not reviewed for tax, and achieves the historic average investment return of the ‘Mixed Investment 40-85% Shares’ sector after fund costs. This could represent the performance of a common diversified portfolio, although, actual returns could have been higher or lower than this. For simplicity, we’ll assume that all returns are capital gains. Performance in the last 10 years has relatively been strong and a £253,547 after tax return over a £300,000 initial investment looks pretty satisfactory at an average of 6.32% per annum. And even though investment performance is not the objective of this piece, the positive return masks tax inefficiency. The first mistake of which is to invest in a sole name rather than splitting the investment with a spouse or civil partner, if there is one. That is not always possible, but I generally advise families as a whole, rather than individuals, and it still surprises me to see that one spouse will usually hold most of any investments to the detriment of their available tax allowances. Splitting investments into joint or individual names will, therefore, gain access to two sets of ongoing tax allowances. There may, of course, be a very good reason why you shouldn’t do this, but in most cases, two sets of tax allowances are better than one. So, in the case above, a scenario in which the investor sensibly invested in a diversified mix of assets, and who manages to hold for 10 years without touching it, the result on full sale would be a capital gain of £314,008. After deduction of the current tax year £11,700 CGT allowance sale, tax due at the current higher CGT rate of 20% would be £60,462 (although rates have been far higher historically and could increase again). The net return is £253,547. There is a more tax efficient way. Tax-free ISAs and the CGT allowance are available for individual use annually. Without investing any further sums, it is possible to realise both capital gains and losses annually up to the CGT allowance by selling existing funds. Gains realised within the CGT allowance are tax exempt and the sale receipts can be used to reinvest in the tax-free ISA account of both spouses and/or buy new funds outside of the ISA, which resets the gain on it to zero. 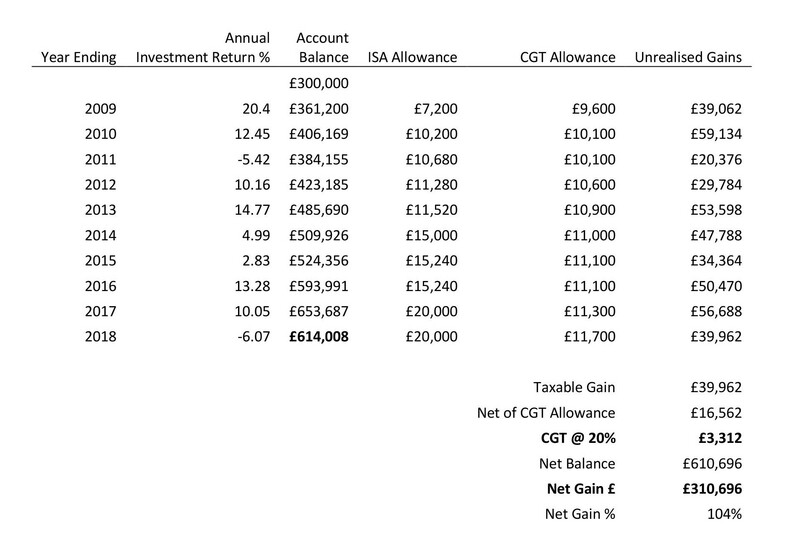 In table 2 below, you can see that the investment of £300,000 could have grown into the same £314,008 gain over 10 years, but with a significantly higher after-tax value of £310,696 because both spouses annual ISA and CGT allowances were used consistently every year. Doing this effectively raised tax-exempt money from funds sales, reinvesting some of it via tax-free ISAs and resulting in an average annual after-tax return of 7.37%. You can see in the ‘Account Balance’ column that the ending value before tax of £614,008 is no different to that in table one. Investment returns are the same and it is not investment returns that create additional value. It is the available annual tax allowances used consistently to manage the unrealised gains, which can be seen in the last column of each table. Tax planning, in this case, could have saved the family £57,149 in tax by doing no more than managing their ISA and CGT tax allowances consistently each year. Although the above tables use the actual investment returns and tax allowances of the last 10 years any investor will have had a different experience due to personal circumstances, their tax position, risk profile and associated portfolio returns. In addition, tax legislation can change in the future so a past example is not indicative of what could happen in the future. However, tens of thousands of pounds of value could be retained by utilising something as simple as using ISA and CGT allowances consistently every year. Some investors have time horizons measured in multiple decades together with additional tax allowances available such as the use of pension tax relief. The true value of consistently using tax allowances as part of your financial planning should be clear and well worth the effort.